Tomorrow my Classes will be listening to a podcast of one the best ” Scary Stories” ever The Tell Tale Heart by one of the most interesting writers of horror fiction, Edgar Allen Poe. Today lets take a look at who he was. dgar Allan Poe was born January 19, 1809 in Boston, where his mother had been employed as an actress. Elizabeth Arnold Poe died in Richmond on December 8, 1811, and Edgar was taken into the family of John Allan, a member of the firm of Ellis and Allan, tobacco-merchants. Poe’s mother, Elizabeth Arnold Poe, died in Richmond on December 8, 1811. Moldavia, Poe’s last home in Richmond located at Fifth and Main Streets. John Allan bought the house in 1825, and Edgar lived there before entering the University of Virginia in 1826. In Boston on May 26, 1827, Poe enlisted in The United States Army as a private using the name Edgar A. Perry. After two years of service, during which he was promoted to the rank of Sergeant-major, he secured, with Mr. Allan’s aid, a discharge from the Army and went to Baltimore. He lived there with his aunt, Mrs. Maria Poe Clemm, on the small amounts of money sent by Mr. Allan until he received an appointment to the U.S. Military Academy at West Point. Meanwhile, Poe published a second book of poetry in 1829: Al Aaraaf, Tamerlane and Minor Poems. After another quarrel with Allan (who had married a second wife in 1830), Poe no longer received aid from his foster father. Poe then took the only method of release from the Academy, and got himself dismissed on March 6, 1831. Soon after Poe left West Point, a third volume appeared: Poems by Edgar Allan Poe, Second Edition. While living in Baltimore with his aunt, Mrs. Clemm, young Poe began writing prose tales. Five of these appeared in the Philadelphia Saturday Courier in 1832. With the December issue of 1835, Poe began editing the Southern Literary Messenger for Thomas W. White in Richmond; he held this position until January, 1837. During this time, Poe married his young cousin, Virginia Clemm in Richmond on May 16, 1836. Poe’s slashing reviews and sensational tales made him widely known as an author; however, he failed to find a publisher for a volume of burlesque tales, Tales of the Folio Club. Harpers did, however, print his book-length narrative, Arthur Gordon Pym in July of 1838. Little is known about Poe’s life after he left the Messenger; however, in 1838 he went to Philadelphia where he lived for six years. He was an editor of Burton’s Gentleman’s Magazine from July, 1839 to June, 1840, and of Graham’s Magazine from April, 1841 to May, 1842. In April, 1844, with barely car fare for his family of three, [including his aunt, Virginia’s mother, who lived with them], Poe went to New York where he found work on the New York Evening Mirror. In 1840, Poe’s Tales of the Grotesque and Arabesque was published in two volumes in Philadelphia. 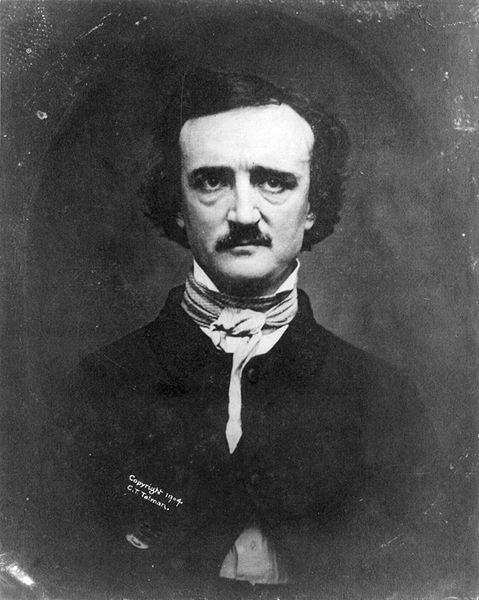 In 1845, Poe became famous with the spectacular success of his poem “The Raven,” and in March of that year, he joined C. F. Briggs in an effort to publish The Broadway Journal. Also in 1845,Wiley and Putnam issued Tales by Edgar A. Poe and The Raven and Other Poems. The year 1846 was a tragic one. Poe rented the little cottage at Fordham, where he lived the last three years of his life. The Broadway Journal failed, and Virginia became very ill and died on January 30, 1847. After his wife’s death, Poe perhaps yielded more often to a weakness for drink, which had beset him at intervals since early manhood. He was unable to take even a little alcohol without a change of personality, and any excess was accompanied by physical prostration. Throughout his life those illnesses had interfered with his success as an editor, and had given him a reputation for intemperateness that he scarcely deserved. In his latter years, Poe was interested in several women. They included the poetess, Mrs. Sarah Helen Whitman, Mrs. Charles Richmond, and the widow, Mrs. Sarah Elmira Shelton, whom he had known in his boyhood as Miss Royster. The circumstances of Poe’s death remain a mystery. After a visit to Norfolk and Richmond for lectures, he was found in Baltimore in a pitiable condition and taken unconscious to a hospital where he died on Sunday, October 7, 1849. He was buried in the yard of Westminster Presbyterian Church in Baltimore, Maryland. In personal appearance, Poe was a quiet, shy-looking but handsome man; he was slightly built, and was five feet, eight inches in height. His mouth was considered beautiful. His eyes, with long dark lashes, were hazel-gray. 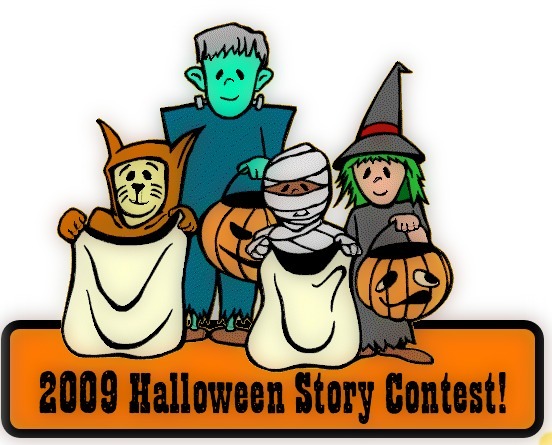 Deadline is October 29th, 2009. All stories should be blogged on this link, Or put in Ms. Broderick’s Mailbox.